Fig. 23. 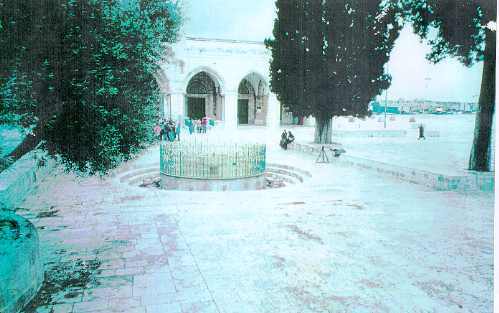 El Kas Fountain, "The Trophy"
El Kas, "The Trophy": This is the only place pn the Temple Mount where one can place the Temple at a lower level. There is no clear evidence regarding the depth to bedrock in this area. The altitude levels which were drawn by the British surveys were only an assumption. However the bedrock of Mount Moriah does drop sharply in this area. The sub-surface is supported by great arches and vaulted chambers.